A DRI investigator walks gingerly among seven babies – with another eight babies outside the frame – splayed across the floor at an orphanage we recently visited in Nairobi, Kenya. We know you care about children with disabilities and the work of Disability Rights International – and we continue to need your support. 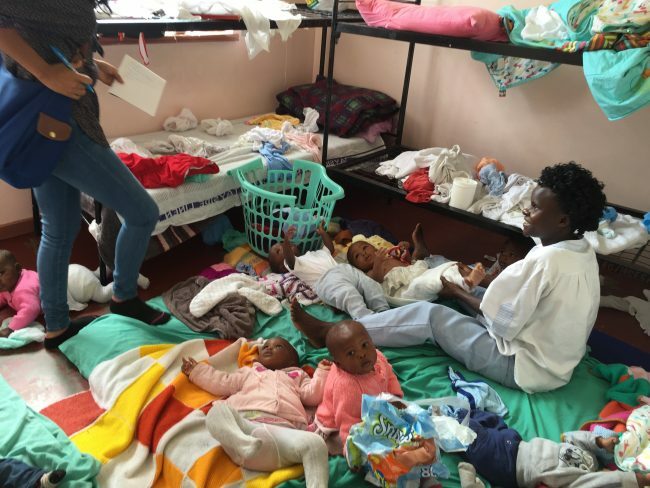 There were a total of 60 infants at this Kenyan facility, with only 4 caregivers, barely able to wash, feed and change diapers. No time for play, hugs, kisses or responding to a cry of fear or the need for touch. Even orphanages with the best intentions cannot provide for the needs of infants and toddlers in a large group setting. No matter how clean or humane they might appear, physical and psychological damage will occur. Children must have the one-on-one care of a parent or family member. Research shows that for every three months an infant or young child is institutionalized, the child loses one month of development. Growth is stunted. Attachment disorders and failure to thrive are common. Many will die, not from lack of food or shelter, but from lack of love. We know that there are 10 million children in orphanages around the world and up to 95% of them have at least one living parent and extended family. It is poverty and disability that push families to give up their children – thinking they might have a better life in an institution. And sadly, most families would keep their children with some support. And we know babies and children with disabilities will likely spend their entire lives in institutions, locked away and forgotten. As part of DRI’s Worldwide Campaign to End the Institutionalization of Children we are educating governments, the public and donors of the inherent dangers children face segregated in institutions (you can see a recent article about the Campaign in The Guardian on our website) and the need to shift donor dollars to support vulnerable families – a safer and less expensive solution. Because of the work you support, many countries are beginning to assist at-risk families rather than building institutions. We are making great progress toward our goal, but we can’t get there without you. Please help us continue to fight for the human rights of all institutionalized children around the world. Thank you. Warmest regards and a peaceful New Year.